Well it has been a year since I moved to San Francisco…not the easiest move and transition I’ve ever made. It has taken me the whole year to get things together. Actually it has taken me hitting the bottom (mentally) to realize I needed to pull it together…so that’s what I’m doing. For anyone that is my friend and really knows me, knows I don’t do anything halfway…its all or nothing. So game on! Before I layout my plans for the year I will talk about the many short comings I have experienced this year…Ugh there are many. I have found it not the easiest place in the world to make friends here in San Francisco…people are nice but many have their own little groups and it is very hard to break into…or the other kind of people here seem to be very transient; so here today gone tomorrow. I’m pretty out going person so this has been a tough thing to deal with…there are days I’m just lonely. The second biggest thing has been training for another figure competition…but not truly seeing eye to eye with my new coach. So I hired a new coach, he came highly recommended and has produced lots of winners. I started training with him in April and he immediately wanted me to put on more weight. From the very beginning I was not comfortable with this idea…but I went with it for 7 months. I was eating 2700 -3200 cals a day. It took the entire time for me to put on 8 lbs. The end result was I did not like how my body looked. I looked in the mirror and saw fat…and that was extremely demotivating. I was in the gym 1.5 hours a day and I was not seeing any change except getting fat (IMO). Then I injured my shoulder…I think most of it was caused from stress but none the less it was an injury…so this was my out to not compete this season.Now I had nothing to show for my 7 months except being fat (again my own opinion). So that was extremely depressing. Now lets add the most crazy work schedule I have had in 6 months to this and poor Liz hasn’t wanted to get out of bed…though fatigue could be part of this problem. So yesterday I got up and decided to pack my little dogs in the car and take a road trip…clear my head…and come up with a planof action. Because honestly I can’t stand myself and I’m the only one that can do anything about it. Trading in my bikini for…a new Speedo, swim goggles, and swim cap. I looked for water wings but they were all out! I registered to run the LA Marathon (again) on March 17, and I’m going to do the Redland Triathlon Feb 24…hoping to work up to doing Escape from Alcatraz March 3. The running is not a problem for me…it will just be getting my endurance back up…the cycling, I don’t see that as a problem. But what really worries me is the swim. So I will be spending alot of time in the pool in the coming weeks. I promise to keep my blog up to date during the journey. 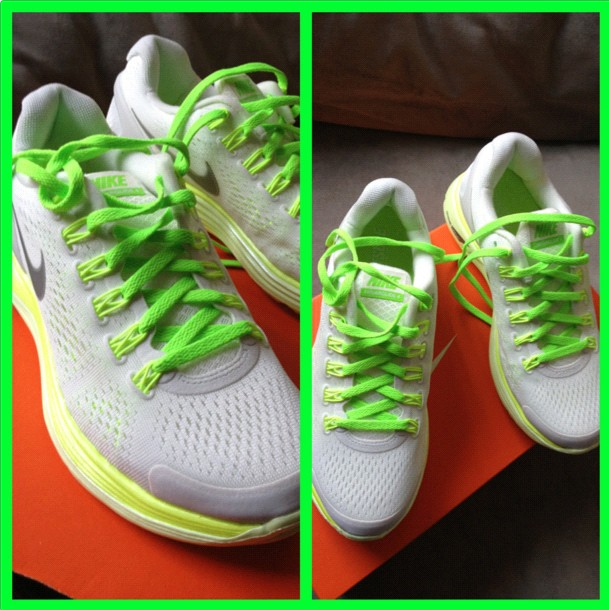 So I went to the Nike store today and found a great new pair of Lunar 4+ and I’m so excited to try the Nike+ app. Here we go! All in!!! Enjoyed reading your post. Reminded me of a friends saying ” There’s good news and bad news. Bad news is ‘you are responsible’. The good news, ‘you are responsible’.” Best wishes on your journey !